The femoral nerve is the major nerve that serves the tissues of the thigh and leg, including the muscles and skin. 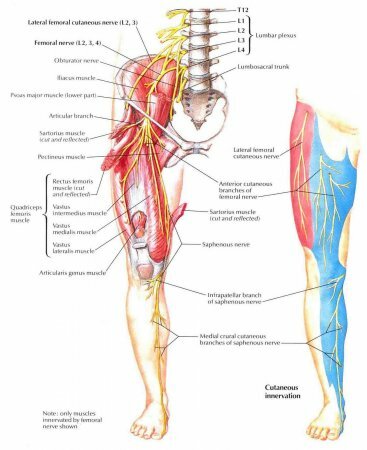 While the much larger sciatic nerve also passes through the thigh on its way to the lower leg and foot, only the femoral nerve innervates the tissues of the thigh. Nerve signals carried by the femoral nerve are crucial to the function of the legs, including standing, walking, and running. The femoral nerve begins as the largest nerve to extend from the lumbar plexus in the lower back as a combination of fibers from the L2, L3, and L4 spinal nerves. From the lumbar plexus it extends with the fibers of the psoas major muscle inferiorly through the abdomen along the anterior surface of the hip bone. As it passes through the abdomen, a branch of the femoral nerve extends to provide nervous connections to the iliacus muscle, a flexor of the thigh. From the abdomen the femoral nerve next passes deep to the inguinal ligament in the groin and crosses the hip joint to enter the femoral region. In the femoral region, the femoral nerve separates into two nerve trunks - the anterior and posterior divisions - before further dividing into many smaller branches throughout the anterior and medial thigh. Several cutaneous and muscular branches split from the anterior branch of the femoral nerve to carry nerve signals to specific targets in the thigh and leg. The medial cutaneous branch spreads vertically throughout the skin of both the medial thigh (through its anterior branch) and the medial leg (through its posterior branch). Extending parallel to the medial branch, the intermediate cutaneous branch spreads throughout the anterior surface of the thigh. Muscular branches of the anterior femoral nerve extend to the pectineus and sartorius muscles, which flex, adduct, and abduct the thigh. The posterior branch of the femoral nerve forms several important branches that serve the leg and are vital to the extension of the knee. Its muscular branches innervate the four quadriceps muscles (rectus femoris, vastus lateralis, vastus medialis, and vastus intermedius), which flex the thigh at the hip and extend the leg at the knee. The cutaneous branches form the saphenous nerve, the largest branch of the femoral nerve, which runs parallel to the saphenous vein in the subcutaneous layer toward the lower leg. In the leg, the saphenous nerve innervates the skin along the anterior and medial surfaces. The femoral nerve is a mixed nerve, meaning that it combines both afferent and efferent fibers in the same nerve. Afferent nerves carry important sensory information from the tissues of the thigh and leg (especially the skin) to the central nervous system for processing. Efferent neurons perform the essential function of carrying signals to the muscles of the thigh and leg to control their tension and movement. Thus the femoral nerve functions like a two-lane road, carrying information both to and from the brain through two sets of one-way neurons. These signals permit the body to react to stimuli and produce a variety of movements, including walking, running, and maintaining balance.